The world is experiencing a global leadership crisis: 89 percent of organizations say leadership is a top and pressing problem, while only a disproportionate few have a functioning leadership pipeline. Organizations in every industry, human services included, are feeling the effects of this crisis. LeadingAge Indiana decided to do something about it. In 2014, LeadingAge Indiana formed a task force to identify how LeadingAge associations across the nation were supporting leader development. The task force looked at courses offered, training session frequency, program components (e.g., coaching), and content, specifically custom content versus purchased content. After finding considerable variability, they decided to base their program on a tried and true, research-based leadership model called The Leadership Challenge®, supplemented by customized program components. LeadingAge Indiana is an association whose members are nonprofit organizations providing long term care, services, and housing for the elderly in Indiana. The association provides members with education, group services, up-to-date information, networking, and leadership development, as well as prompt, efficient service for the professional staff. Many current leaders in the organization are at or near retirement age, constrained budgets limit formal leadership training for potential successors, and the demand for elderly care is expected to increase significantly as Baby Boomers continue to age. 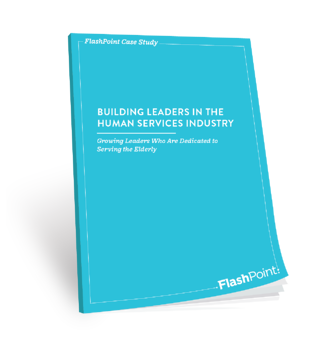 FlashPoint worked with LeadingAge Indiana to develop a multifaceted, highly interactive nine-month leadership development program, LEADERSHIPVIP, based on The Leadership Challenge® Workshop. The new program is available to association members who are current and emerging leaders within their organizations. Leaders participate in a rigorous and selective application process, including a resume, essays about their leadership and commitment to aging and human services, two letters of professional reference, and a commitment form. Pre- and Post-360-Degree Competency Assessments: The assessment (LPI®: Leadership Practices Inventory®) shares how frequently leaders demonstrate specific leadership behaviors, identifies development opportunities, and measures their leadership effectiveness after the program. Individual and Group Coaching Sessions: Individual coaching offers the opportunity for personalized guidance in interpreting assessment results, creating individual development plans, focusing on goals, and refining participants’ leadership visions. Group coaching gives leaders a shared experience and the opportunity to inspire fellow learners as they all work toward their fulfilling their visions and accomplishing their goals. In-Person and Virtual Learning Sessions: During the in-person sessions, leaders learn The Five Practices of Exemplary Leadership® and build stronger relationships with peers. In virtual sessions, they explore how they are applying the Five Practices of Exemplary Leadership back on the job and participate in exercises to deepen their knowledge of each practice. Action-Learning Project: Participants practice the skills they are learning as they lead a real-life project to benefit their organization or an organization in their community. Capstone Event: A two-hour opportunity for participants to celebrate the successes of their transformation, share individual learning, and continue to network with peers. 78% of participants who have taken the post 360-degree assessment improved their ratings in all Five Practices. 16% of leaders have been promoted or moved into a position of greater responsibility.